An epic, spine-chilling story of terror, mystery and black magic set in the Middle Ages. "In Paradise, in the glades of Eden, Eve was tempted twice: first by Lucifer. Then by Rosifer who offered her a rose plucked from Heaven". Matthias Fitzosbert is the illegitimate son of the parish priest of the village of Sutton Courteny in Gloucestershire. The Rose Demon explores the nature of Matthias's unique relationship with Rosifer, the fallen angel, the spirit he loves yet hates, strives to placate but ultimately flees from. 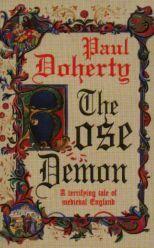 The story of Matthias is played out against the vivid panorama of medieval life: the fall of Constantinople; the last throes of the Wars of the Roses; the terror of witchcraft; the loneliness of the Scottish marches; the battlefields of Spain and finally the lush jungles of the Caribbean where the Rose Demon and Matthias meet for a final, dramatic confrontation.